Bellini's six-decade long career was propelled by his own tendency to absorb ever newer and more advanced painting techniques. Drawing inspiration from his surroundings in one of the busiest commercial and religious centers in Europe, Bellini's art was infused with a love of Venice and an astounding religious reverence his entire life. 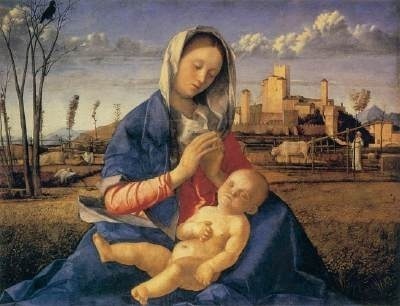 Although researchers do not agree as to when Giovanni Bellini first appeared on the Venetian art scene, most can agree that his earliest work was conducted under the auspices of his father, Jacopo's, renowned workshop where he received training and probably assisted on a number of commissions. 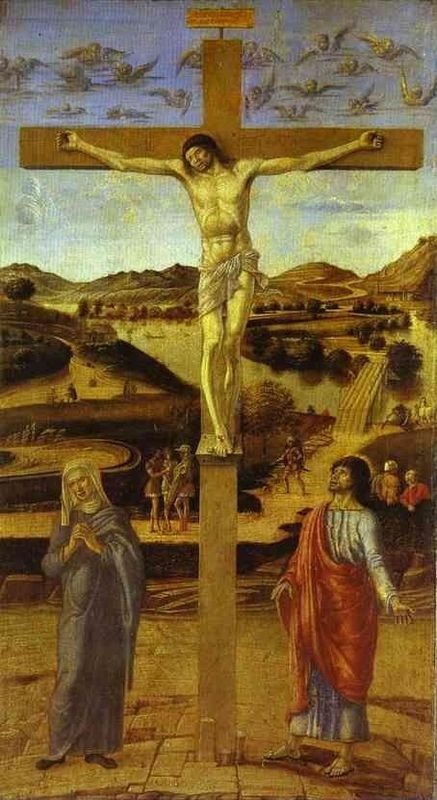 Giovanni Bellini's Crucifixion is widely accepted as a contribution to Jacopo's now fragmentary Gattamelata Altarpiece from the late 1450s. Jacopo Bellini had studied art extensively in Tuscany and had brought Tuscan-inspired visual perspective techniques to Venice where he instructed his son in their execution. Bellini's earliest years as a painter are also marked by a strong influence from his brother-in-law, the Paduan painter Andrea Mantenga. Mantegna had studied perspective and Roman archeology and his affinity for structure and colossal elegance defined many of his paintings. 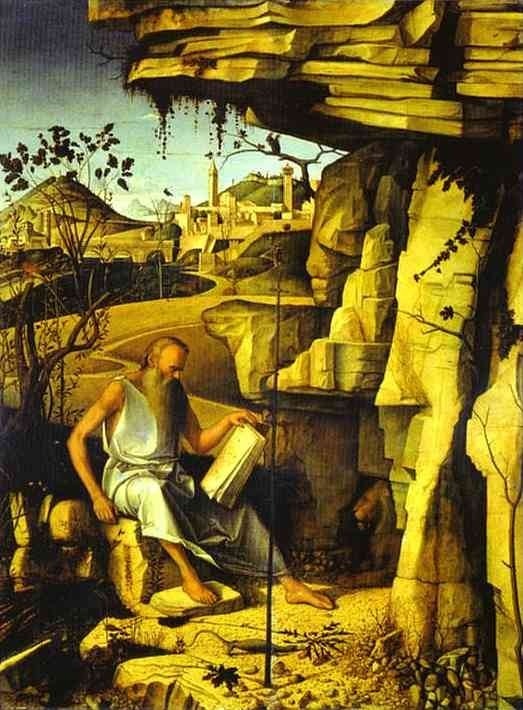 The eager student, Bellini, took many lessons from his skilled relative and much of his early work harbors that same desire for structure, clear delineation, and bold contour lines found in Mantegna's. 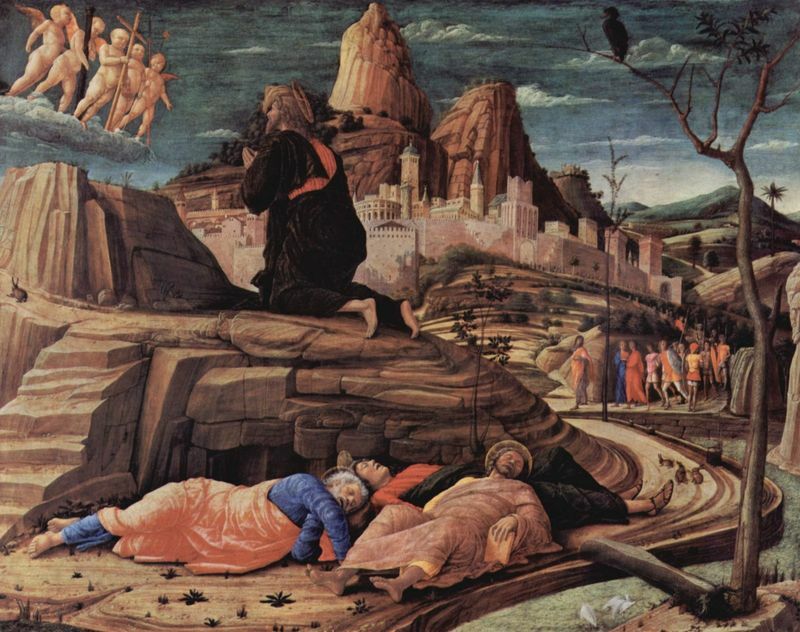 Bellini's painting, Agony in the Garden, represents these techniques as well as foreshortening, another Mantegnesque addition. Much of the art from this time period was descended from the Byzantine tradition of painted icons and Bellini's was no different. Religious and political leaders alike had a near-insatiable appetite for images of holy figures to adorn their churches and public buildings. Naturally, painting image after image of the Madonna and Christ Child would have been a lucrative business for a painter of Bellini's caliber and he met the demand. Bellini is regarded as one of the greatest Madonnieri, or Madonna Painters, of his generation, and his early work is especially representative of that theme. By the time Bellini reached the middle of his career, he had studied the work of skilled painters from the north of Europe and was eager to imitate their style. Much of the appeal of the northern style was its use of oil paints, championed by Flemish painter Jan Van Eyck, rather than the old-style tempera paints. It wasn't until the 1470s -when Sicilian artist Antonello da Messina paid him a visit that Bellini switched almost exclusively to oil paints in his work. 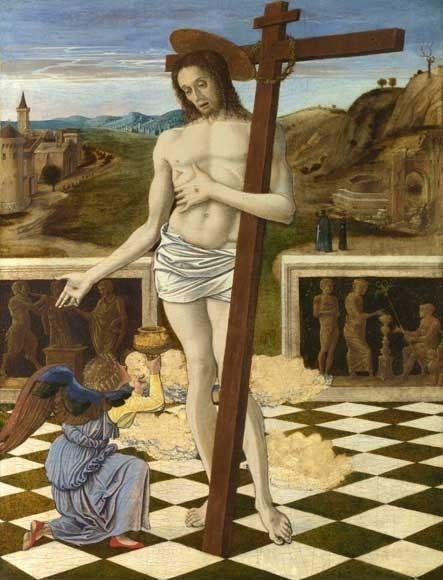 Messina is credited with spreading oil painting techniques already used in Northern Europe throughout Italy, and Giovanni Bellini upgraded his style without hesitation. 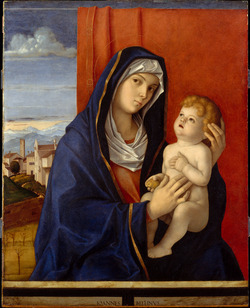 Oil paints gave Bellini's work - which already exhibited a superior grasp of lighting techniques and color theory - a luminous, life-like quality that tempera paints lack. He is celebrated for producing figures with an unprecedented depth of emotion and for imbuing his work with a seamless blend of color. 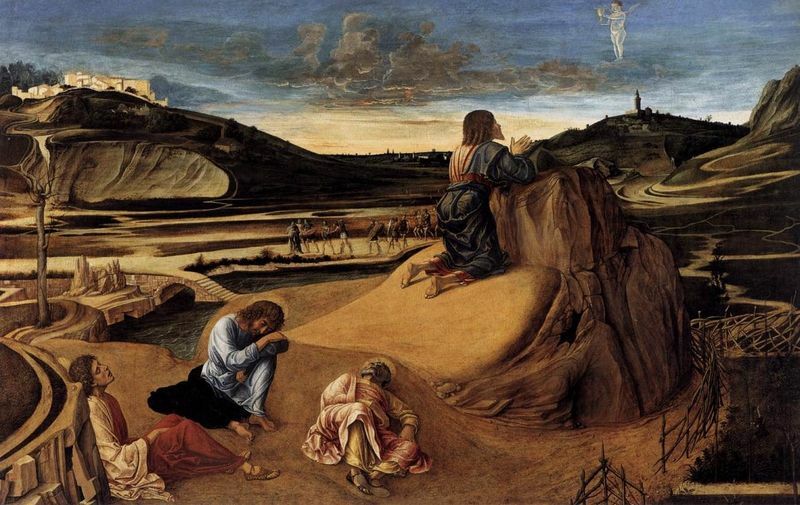 Although the Bible continued to inspire him, Bellini's later work introduces an even greater attention to background, landscape and atmosphere than it previously had. As Venice transitioned from the early years of the Renaissance to the later years, a hallmark of its artistic style became the exaltation of sensuality and atmosphere over form and shape. Bellini was instrumental in facilitating this transition, moving away from Mantenga's influence and using oil paints to help him along the way. His love of the Venetian landscape is apparent in many of Bellini's works, such as Madonna of the Meadow. Previously, landscape and background were not usually emphasized in paintings for fear that detailed landscapes might divert attention from the scene being depicted. Bellini, instead, used backgrounds to enhance the primary image, often incorporating relevant details into the landscape so that the background often told half of the story. The figures that Bellini produced toward the end of his career continued to display fewer and fewer contour lines, in favor of using oil paints and a Venetian preference for the sensual to produce figures with softer, glowing edges. In conjunction with this preference for the sensual, Bellini began to paint an increasing number of mythological and allegorical works, in which landscape played a crucial role. The dominant medium of the European Middle Ages, tempera paints were comprised of pigment and some kind of binding agent, usually egg yolk during Bellini's life. Bellini's early works were produced using tempera, which was fast-drying and made blending colors and creating spatial illusions extremely difficult and time-consuming. Bellini's work using tempera does display his eye for three-dimensional figures and color techniques, but it wasn't until he began to use oil paints that his talents found their stage. What tempera lacked in pop-factor, oil paints - under Bellini's studied hand - made up for in droves. Oil allowed Bellini to produce figures with a greater emotional depth than he could previously achieve in tempera thanks to its slow-drying, blendable properties. Oil paints afforded Bellini the opportunity to create the soft, luminous and life-like figures Venetian art would become famous for.